Sir Ringo Starr To Spread Tenth Anniversary Peace & Love . Beatles Radio: The Beatles, Solos, Covers, Birthdays, News The Fab 4 and More! 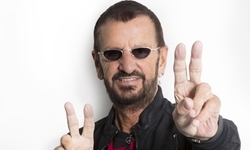 The recently knighted Sir Ringo Starr has announced plans for this year’s tenth anniversary Peace & Love celebration on his birthday on 7 July. Ringo turns 78 on that day, and will mark the anniversary of the initial 2008 event (which took place in front of the Hard Rock Café in Chicago) by appearing at the Hard Rock in Nice, France, during his European tour with his All-Starr Band. The idea remains the same: to invite his fans to express the phrase “peace and love” in speech, thought and by posting #peaceandlove, and to generate a wave of positivity that spans the globe. The former Beatle has also unveiled the new video for ‘Give More Love,’ the title song from his 2017 album. Directed by Brent Carpenter, the clip features photos from fans depicting peace, love and kindness, selected from those submitted in a Give More Love contest. Ringo and the All-Starr Band’s summer tour begins on 2 June in Atlantic City and runs until 11 July.